I am not a huge cannoli fan; something about too much cream and not enough chocolate… But cannoli flavors in a cupcake? Game on! The cannoli cupcake is really a regular cupcake, filled with cannoli cream, and then topped with a special chocolate frosting. 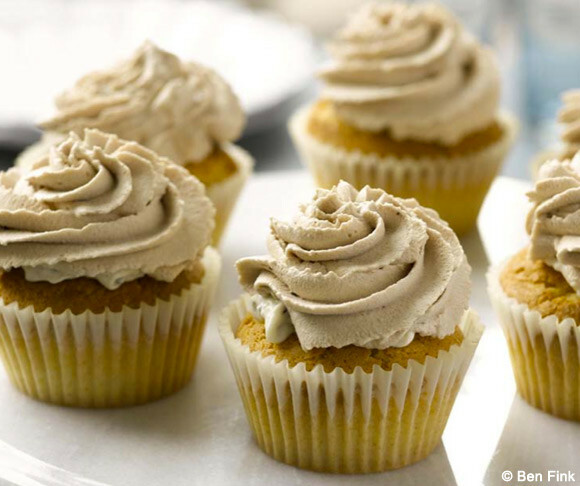 I’m proud of my homemade cupcake recipe for 3 reasons: there’s no vegetable oil in it, it’s fairly light (1/2 cup yogurt and 1/2 cup butter instead of the traditional 1 cup of butter), and you can whip up the batter in a snap in a single bowl. All the dry ingredients get mixed together and then all the wet ones get added in. The key to delicious cannoli cream is using the right ricotta–ricotta impastata. It’s a ricotta that’s already been drained so it’s very thick and creamy. It’s definitely worth looking for at your local Italian deli. They sell it at some Costcos, or you can buy it online. You can use regular ricotta, but you have to drain it first: wrap the ricotta in cheesecloth and wring it out. 1. Position a rack in the center of the oven and preheat the oven to 350°F. Have your littlest helper put paper liners in a standard 12-cup muffin pan. 2. To make the cupcakes: In a medium mixing bowl, whisk together the flour, sugar, baking powder, and salt. Add the butter, yogurt, egg and yolks, and vanilla. Mix with an electric mixer on medium speed for 3 minutes (set a timer), occasionally scraping down the sides of the bowl with a rubber spatula. Divide the batter evenly among the cups. 3. Bake until the cupcakes are golden brown and a wooden toothpick inserted in the center of a cupcake comes out clean, 20 to 25 minutes. Cool in the pan for 5 minutes. Remove the cupcakes from the pan, transfer to a wire cooling rack, and let cool completely. 4. To make the cannoli cream: In a mixing bowl, whisk together the ricotta, confectioners’ sugar, and vanilla until smooth. Stir in the mini chocolate chips. Transfer to a quart-sized resealable plastic bag. Using scissors, snip off 1/2 inch from a closed corner of the bag. You will use the plastic bag as a pastry bag to fill the cupcakes. 5. Using a small knife, cut a deep, inverted cone out of the center of each cupcake, and remove the cones. You won’t need the cupcake cones, but I’m sure you can find a willing customer to help you eat them. Use the plastic bag to fill the cupcakes with the cream. Use a knife to smooth the top of the filling flush with the cupcake. 6. To make the cocoa whipped cream: In a chilled medium bowl combine the heavy cream, confectioners’ sugar, and cocoa powder and beat with an electric mixer on high speed until the cream forms stiff peaks. 7. Snip 1/2 inch from a closed corner of a gallon-sized resealable plastic bag. Insert a large star tip (such as Ateco 825) in the bag and poke it through the snipped end. Transfer the cocoa cream to the bag. Pipe swirls of the cocoa whipped cream over each cupcake. Sprinkle each with about 1 teaspoon of mini chocolate chips. Refrigerate, uncovered, until ready to serve. My God these are just gorgeous! I really enjoyed looking over your site you have some wonderful work. Keep it up!! !